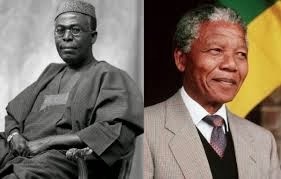 Writer and poet, Odia Ofeimun, has rated the late Premier of the old Western Region, Chief Obafemi Awolowo, above late former South African President, Nelson Mandela. The social critic, in an interview granted to Sahara TV which was uploaded to YouTube, said although “Mandela was good for the liberation” of his people, Awolowo made far-reaching impacts on the lives of many Nigerians. He said Awolowo negotiated Nigeria’s independence just as Mandela did, adding that it would amount to a “hype” to think that there were differences in what the two leaders essentially fought for in their respective countries to end colonisation. Ofeimun said, “I am too much of an Awolowo man not to see that the process of moving into independence in South Africa and in Nigeria followed exactly the same pattern. It was based on a negotiated settlement. The liberation struggle did not create the end of apartheid. It was a negotiation and Nigerians negotiated exactly the way Mandela negotiated. “You can hype it if you like, but the pattern was exactly the same. You move from one meeting to the other, discussing politics and economics, and they successfully convinced Mandela to buy the pig in a poke of an economy and they also successfully succeeded in convincing Nigerians to buy the pig in a poke of an economy. While choosing Awolowo above the late anti-apartheid leader, Ofeimun said the philosophical postulations about the workings of a state put forward by Awolowo were superior to those credited to Mandela. Insisting that Mandela could not match the stature of Awolowo, the Edo State-born poet said Ghana’s first President Kwame Nkrumah was the only African leader that could be seen to rival Awolowo. But according to him, Nkrumah’s ideology of pan-Africanism lacked the capacity to “save Africa’’ when compared to Awolowo’s brand of socialism. He said, “People talk about Mandela’s capacity to put various classes (of people) together as theory, but Awolowo ironed it out very clearly, why you don’t need a class struggle, in order to create a society in which all children can go to school; in which everybody can get a job, and in which old age pensions will be paid to people. “It is not just love and I want to emphasise that. Those who criticise Awolowo’s socialism for wanting in love are obviously basing their argument on his claim that a government should be like a sun that shines on all equally. If it is about a theory of how to bring the people together on the African continent, none is as good as the Awolowo’s and I’m not trying to pretend.